There are some products out there that I umm and ahhh about buying for months on end. I then buy them and wonder why I waited so long to add it to my ever-growing collection. This is one of those products. I have wanted a lip scrub for pretty much forever now and Lush had always been on top of my list of the ones to try. To be honest I used to look at it everytime I popped into Lush but hadn't bought it until I went to London last week when I realised enough was enough and it about bloomin' time I invested in it. 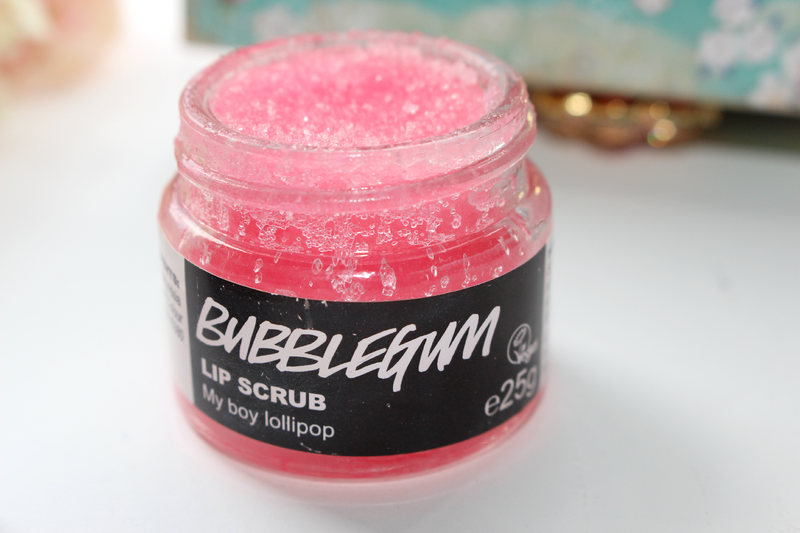 Being a huge sweet lover there was no doubt in my choice of Bubblegum from the range of lip scrubs available. This smells SO good - if you are a sweet-toothed fiend like me you will probably just want to eat the pot! Made with caster sugar and jojoba oil this scrub helps to exfoliate and soften the lips to help ensure a perfectly smooth base for all your favourite lip products! I pretty much have dry lips all year round, flaky skin and general grossness does NOT look good when doing my make-up each day, so this has been welcomed into my morning routine with open arms! This has totally changed my lips and I'm SO happy for my new soft and polished smile, I've been using it every single day and it doesn't even look like I've used any - this is going to last for months and months! The scrub is £5.50 and you can check it out - here. I've been meaning to try this for ages but I know I'll definitely end up eating it more than using it! 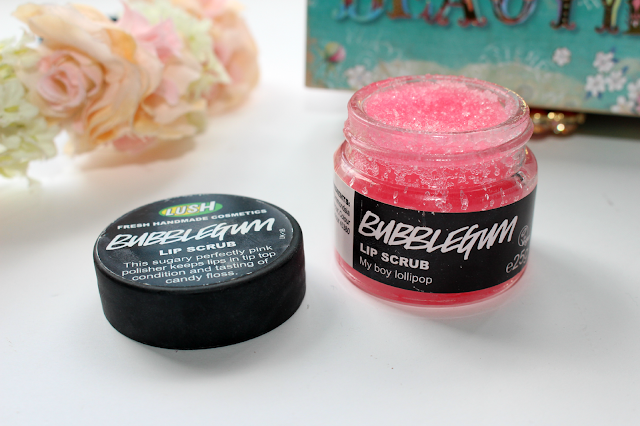 I love the lip scrub but I don't like the popcorn version! Absolutely love Lush's lip scrubs, they are my fave! Make sure you check out my giveaway - a Beauty Box full of products, worth nearly £60! Click HERE! I love this scrub so much but I do end up getting it EVERYWHERE. So clumsy haha! I'm a huge fan of this too and the smell is so delicious :) I try to use this every evening but I always use it before matte lipsticks now and it's made such a difference. I love this and I was the same way when I first got it. This was actually the first thing I bought from Lush and reviewed on my blog almost 4 years ago. It is just lovely and hope you enjoy it as much as I do. I tried this a while ago and it smelt and tasted so yummy I just ended up eating it ahaha! Lip scrub is a must for me every morning! Unlike everyone else the popcorn one is my fave! Oooh these are great. I've used the Popcorn one and it was fab, you've just reminded me that I need to repurchase this! It's soooo yum! So is the popcorn one, they feel amazing to use too! I love this lip scrub! Omg yes yes yes,I love seeing good reviews on this I've been dying to check this out!!! Ahh just another reaffirmation that I need this in my life, my lips are literally just like yours! I've had this for ages and I absolutely love it, it smells & tastes SO good! It also makes my lips so soft, perfect for when I'm wearing matte lipsticks. I can't believe I haven't tried this yet, it's been on my wish list for forever! I have the Pop Corn one. I like it!! !